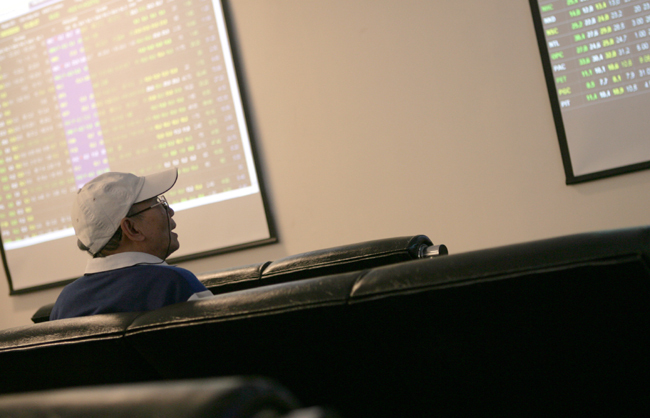 HA NOI (VNS) — Vietnamese shares yesterday advanced on both bourses as blue chips recovered on rising demand at the end of yesterday's trading session. On the HCM Stock Exchange, the VN Index was up 0.2 per cent to close at 564.13 points, extending its gains into a second day. The HNX Index on the Ha Noi Stock Exchange rose a fraction with 0.1 per cent to finish at 76.69 points, ending its four-day losing streak. Big stocks rose sharply and helped boost the market. Bao Viet Holdings (BVH) was up 1.1 per cent; Ma San Group (MSN) gained 3.4 per cent; and Hoang Anh Gia Lai Group (HAG) climbed 4.1 per cent. "The gains came after the US-based investment fund, Market Vector (VNM ETF), adjusted its index late Tuesday, which allowed these shares to increase their density in the fund's portfolio," Bao Viet Securities (BVSC) reported. The change in VNM ETF's investment portfolio could help increase trading volumes for these shares in the next sessions, BVSC said. The financial sector remained inactive as banks have been waiting for the US central bank to make a final decision on whether it would raise the interest rate this week. As a result, the banking sector was down 0.7 per cent compared to Tuesday. Six of the nine listed banks declined or remained flat, including the Bank for Investment and Development of Viet Nam (BID), which fell 6.7 per cent. Three other banks, including Vietcombank (VCB), Sacombank (STB) and Sai Gon-Ha Noi Bank (SHB) were up 3 per cent, 3.2 per cent and 1.5 per cent respectively. In addition, the continuously increasing price of the West Texas Intermediate (WTI) crude oil firm boosted local energy firms. Yesterday, WTI crude rose 0.7 per cent with $44.91 a barrel. Local energy firms, including Petrovietnam Gas Corp (GAS), Petrovietnam Drilling & Well Services (PVD) and Drilling Mud Corp (PVC) were up. These firms rose 0.7 per cent, 0.9 per cent and 1 per cent respectively. An Duong Thao Dien Real Estate Trading Investment (HAR) topped market trading activity with more than 3.7 million shares, but lost 1.7 per cent in market value.